There was mention a while back regarding the original plinth (before it gets made into a selling plinth or request basket), being used as a display plinth. From memory, it just hasn’t been implemented yet. I wonder if this could fit the requirements you’re after. Well, I’m not strictly speaking after anything in that regard as far as the current state of the game is concerned, but that would be a potential solution to the problem of a system that listed the contents of every shop stand in the universe being unnecessarily cluttered by people like me that use those as compact storage modules, if such a system were to be implemented. As long as it could fit as many single-type items as a shop stand currently does, that would do the trick for me and I’d expect it to be easier to implement than some new opt-out system. But an item that shows transaction information that you have to visit might help? If it has a range maybe? And has to be fueled. And configured for a single item? Could make for some interesting new builds. Now that gives me an idea… perhaps instead of listing everything in the universe remotely, and their prices and coordinates, they could make a machine that does that for the entire greater settlement that the machine is placed in. That might be a good compromise. Mall / city / hub owners could just place one of those machines by their entrance portals and people in a hurry could be pointed directly to the stuff that they’re looking for. I would still love some form of market analysis statistics tho, separate from that. I don’t particularly mind if it’s displayed via a specific machine / atlas type thing, or if it’s some UI element that everyone has access to. Read the my post I referenced - I suggested just that. It could require more upkeep if it was longer range - Beacon, Settlement, Planet, Universe - like portals do. People might build a rows of info stands for a market or city? Now that gives me an idea… perhaps instead of listing everything in the universe remotely, and their prices and coordinates, they could make a machine that does that for the entire greater settlement that the machine is placed in . From my perspective, this gives me very little. As a consumer I still have to travel to every settlement, set up a beacon to place a machine (probably), and then see if they have what I want and at what price. While this does save some time, with 48 planets and who knows how many settlements, I am still traveling the entire universe to try and see where I should buy. I understand not wanting to scroll through a huge list of every shop stand. 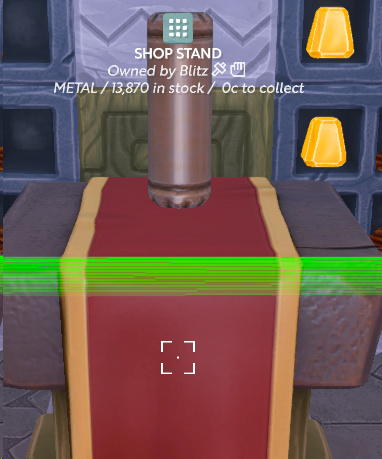 if you have to select and item and then only see the stands with that item, that would reduce the load. I think the real issue is the universe is really pretty big and will (hopefully) get bigger over time. More planets mean more travel time for the consumer. They may or may not find what they want but a lot of other players get coin from footfall. This still seems out of balance to me. If I have no way of knowing who has what and at what price other than exploring the entire universe or having to post on discord or the forums every time, I might as well make better use of my time and make it myself. At least I get xp for that. From my perspective, this gives me very little. As a consumer I still have to travel to every settlement, set up a beacon to place a machine (probably), and then see if they have what I want and at what price. Technically the settlement owner would place the thing and anyone would be able to use it. Kinda like, you know, shop stands. I think it would save considerable time, even if you still need to travel to several settlements. Not every settlement in a planet is focused on having shops, and a machine like that would support the current trend of making huge malls, while making the ‘browsing’ time spent by the consumer within those malls considerably shorter, as they’d get the coordinates of the exact thing they’re looking for without having to look at every single shop. Which I think its fair. If someone is willing to go out exploring every single shop in the universe, I think it’s pretty fair that they’d get the occasional amazing deal that mall goers in a hurry are unaware of. It saves time for people in a hurry and rewards exploration by those not in a hurry, seems like a good balance. I’m pretty sure the universe isn’t peppered with secret little shops selling refined gems at 5c each, price variation is never that dramatic, so it’s not like the people in a hurry would be missing out on game breaking opportunities. I will agree that every settlement does not focus on shops, but the only way to find out is to visit them. So I still think you do take some time. Do you have to visit more than once? No, but with new players coming in, old players leaving, and settlements changing as the game changes, I am not sure that you do not have to continue to explore to see what has changed. Even if last month there were no shops in settlement A, it does not mean there are not any this month. If the point to the economy and shops is to push the mall concept then I think this does fit that model. If you only have to go to 5 places because that is where the shops are then yeah this works well. I think it does put the new shop owner who cannot join a mall or prefers to go solo at a disadvantage. That is why something that looks at all shops (Maybe you have to say your beacon is a shop for the stands to be included) even if it is just by planet seems to put all shop owners on an equal footing. A player might still choose to go to a mall if they are looking for multiple things as they are more likely among more stores to find everything, but it gives all players in game the same chance. I guess one reason I keep pushing on this is, I keep reading where certain players are “disappointed” that everyone can do everything and they believe that hurts the players that want to run a store. Does this impact people buying stuff? Probably some, but if players had better information on what was for sale at what price and where, would they maybe feel that they could save time by actually going to a store to buy versus gathering or crafting? Maybe because I know it would affect how I play, I think it would for others. Right now I do not use stores at all. I hand trade, work with my guild, or barter goods for goods. At least in these instances, I get what I want, I do not waste time, and I develop relationships with other players. This is inside my base. This is a great point which I hadn’t even thought of. I have some stands that are used for a variety of things. So we would have to be able to block stands from reporting the price… another reason to just not allow the the price listing feature right now. I always do everything myself. But I would use the market if it were convenient. The way it is now, it is a massive inconvenience, and much more worth the time to just do it myself. Showing the variation of prices on a world or across the entire universe? Showing the locations of items? Listing all items with all details that are available to buy and sell across a world? Is all information (price, item, quantity, location) that only solution here? Or is there a subset of information (price distribution, location) that satisfies the need? When it comes to location do we want “45N 32E” or “James’ Mega Store in London”? Yes, locations. I don’t like the idea of prices being exposed. It’s practical but joyless. I’d prefer coordinates as I won’t know where to go not being good with names/places like that. But I wouldn’t mind if it was obscured, or if I could craft a location token from their written shop name. Kinda like mall info booths/boards! I rather like it! Both would be best, it’s just easier to remember a name than coords, but if I’ve never been then I need a way to get there, hence both! This is simply not true. Why do you go to one shop or another IRL? Is it always because of price because I assure you that’s not how things typically work. In Boundless, there can be multiple other key differentiators for a shop such as how much stock of each item, ease to get to, ease of shop navigation itself, reputation of the shop owner, etc. Right now, finding things to purchase in-game is a bit of a pain. Each day I log on I spend quite a bit of time just running through portals endlessly until I find what I’m looking for and, inevitably end up getting gouged. I bought a 3x3 AoE hammer the other day for 9000. Saw the same hammer (same rank) for 7000 a couple days later at another shop. I, for one, welcome databases such as what Simoyd and Fuzzy are working on with Boundlesstrade.net and would love an in-game screen like this as well. The “running around to find things” part of online games isn’t fun for me. And that would be beautiful. So you want to ruin Boundless, good for you. Have to agree the running around the malls is painful. Heck I don’t do Malls in real life. As do I. As the game scales in size with worlds and players and items, these sorts of things will become more and more desired. Prices always stabilize to an equilibrium point in an economy with a diverse selection of goods and services. So the more items that are in Boundless, the more stable the prices are going to be. Competition also helps drive that. Whether that ruins the game for you or not is pretty irrelevant. That game is going to evolve to incorporate things that make it more appealing to larger number of players and help retain them. You’re either going to continue playing after certain features are added and adapt or stop playing. I seriously doubt the majority of people that play games with economies like Boundless want to run around for hours trying to find a good price on something or find a place to sell their 10 smart stacks of coal or iron or silver or gold or titanium or whatever it happens to be. The less time it takes for a player to get what they want and get back to that fun activity they want to do the better. So yes Dhusk, it would be beautiful. That I can agree on. You have a reason to visit multiple shops. not all shops carry everything, and the ones who have a large variety are not as likely to have the best prices on every single item with or without that system. you go and realize if you spend 50c more on all your other shopping list items but saves you 20min of travel and you can just go home you have a choice in convenience. This system would just allow you the ability to make such judgements faster and get you back to whatever you were going out to buy items for in the first place (arguably getting you back to the game-play you are progressing through and or enjoying). A craftable display monitor that you can click on and it will give you a search bar for the item and a sort button to sort high low quantity ect. The whole point is to get you to run through as many beacons as possible and visit beacons you would never usually go to in your search to find what you want. And you just want a shortcut. I’m beyond tired of arguing about this. There is a set of you guys that want to rob this game of everything that makes it unique for your own personal convenience or to fit your personal desires. So whatever, put a game breaking database in so you don’t have to search, get rid of footfall, add PvP, make private servers with restricted access. Do whatever you want. You guys scream the loudest so you’re likely to get want you want in the end and bury the game in the process.